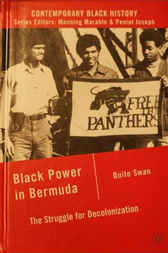 A transnational, pan-African youth movement, Black Power in Bermuda sought freedom for Blacks from the island's White oligarchy and independence from British colonialism. It was spearheaded by activists such as Pauulu Kamarakafego and the Black Beret Cadre. The Cadre maintained relationships with revolutionary organizations across the African Diaspora, such as the Black Panthers. Emerging in the late 1960s, the Movement witnessed the assassinations of Bermuda's British Chief of Police and Governor (1972-1973). Swan carefully details the island's colonial government's attempts to destroy the Movement through military tactics, extensive propaganda, and the implementation of token social concessions. Quito Swan is an Assistant Professor of History at Howard University.